If one things comes into mind after hearing the album for the first time, it is the simplicity of its production. It’s Sumie’s voice that gently dictates the emptiness that is left by the German composer Nils Frahm and pianist Dustin O’Halloran, who are largely responsible for the albums tranquil atmosphere. It takes her about thirty minutes to complete ten modest songs about the blessings and hardships in life. 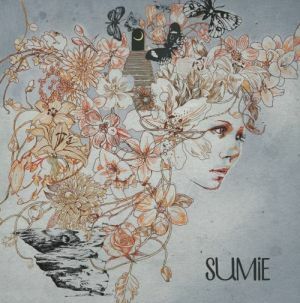 Most tracks are minimalistic centered around Sumie’s peaceful voice and hypnotizing acoustic guitar play. Every now and then backing vocals, strings and O’Halloran’s piano are on the support, yet always in a light manner. These light and repetitive melodies often remind me of children’s lullabies. In fact this is no coincidence for Sumie started recording at home a few years after becoming a mother, so tranquility was of the essence. Tracks such as ‘Spells You’ and ‘Hunting Sky’ captures her feelings of motherhood wonderfully. Qualitatively seen all tracks are strong throughout the whole recording. A constant level of intimacy and sophisticated melancholy is impressively displayed, making the whole a ‘blink-and-you’ll-miss-it’ moment. As said, the album is of a tranquil nature and Sumie undeniably succeeds in her aim to create a meditative and relaxing experience. However this experience can backfire into a dullness of exchangeable songs which on its own is an unjust deprivation of the album. Still if you want to enjoy Sumie to the fullest more than a few attentive spins are needed. Only in this way this delicate production will become timelessly rich, leaving winter at your doorstep. Listeners who, for whatever reason, are not able to give Sumie the proper attention will sooner or later categorize her songs as shallow pop songs. I would say that would be regrettable given her potential. On the other hand, if you’re already involved with one (or a few) of the aforementioned artists, Sumie will probably not be an addition to your music collection. This entry was posted in WRM and tagged Agnes Obel, Ane Brun, cd, Christmas, Cold, Danish, Dustin O’Halloran, Göteborg, German, Gothenburg, Hunting Sky, Japan, Just-in-Time management, Laura Marling, meditative, Nils Frahm, Nina Kinert, relaxing, review, Scandinavia, Spells You, Sumie, Sumie Nagano, Sverige, Sweden, Titiyo, tranquil, Winter. Bookmark the permalink.